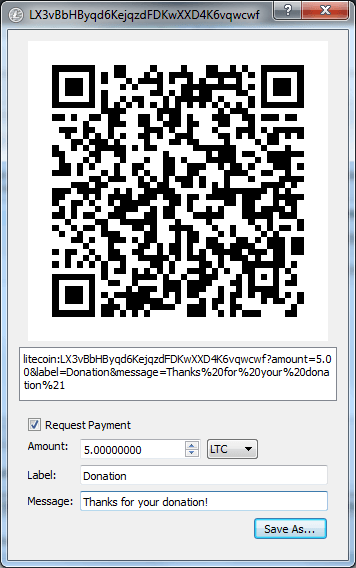 If you want to receive donations on your Litecoin address, there are actually multiple options. The easiest one is of course just copy and paste your Litecoin address and ask people to donate. But let’s be some more creative and make it easier for everyone to donate to your LTC address with less effort. Showing a QR code is a good option of you are expecting donations from more tech savvy users or people who generally know what QR codes are. 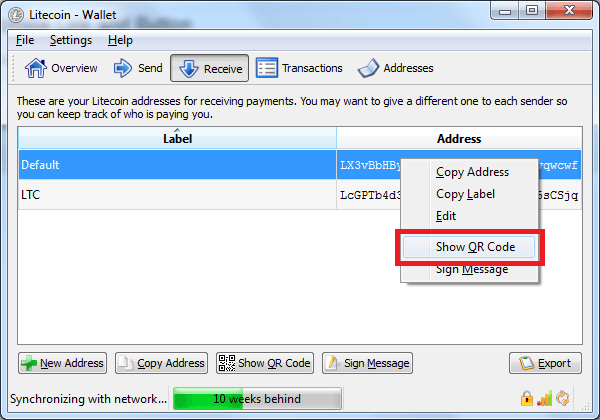 Generating a QR code for your Litecoin address is as simple as opening your wallet, opening the ‘Receive’ tab and right-clicking the address you want to generate a QR code for. You are then presented with your QR code. But since your goal is to receive donations, you might want to add some more information to your code. For instance, you are able to set a suggested amount, add a label and even add a custom message to thank your donor/fan! Cool! You can now go ahead and save the QR code as a picture with a .png file extension to add it to your blog, website or application. Heck, you could even make a sticker with it. Your result could like like the image above. So how do you create such a link? Pretty easy. Just link you would create a link that contains information about a website (the URL), you now create a link that contains your Litecoin address. Your replace my Litecoin address with your address. As you might have noticed, I added to extra parameters to my link. The first one is ‘amount‘, which I’ve set to 2 LTC. The second one is a label, which I named ‘Donation’. And finally the third one is a message for thanking my fan for his contribution. You are free to change any of these values. Double check your Litecoin address is correct and the link works. To test this, you can try to click the link yourself. Creating a donation button to receive Litecoins is an easy one too. 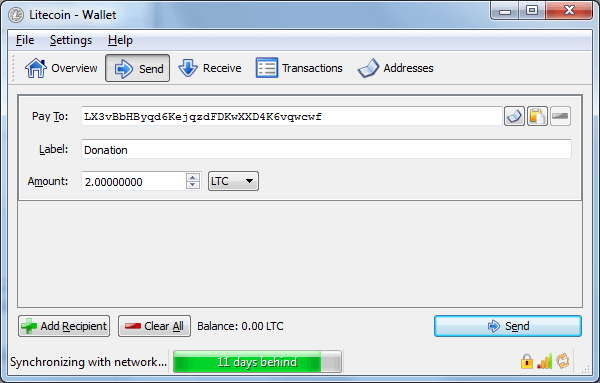 As shown above, you will need to create a link to your LTC address. Now just add an image and you are done already. You shall need to replace the location of the button image to a working one of course.